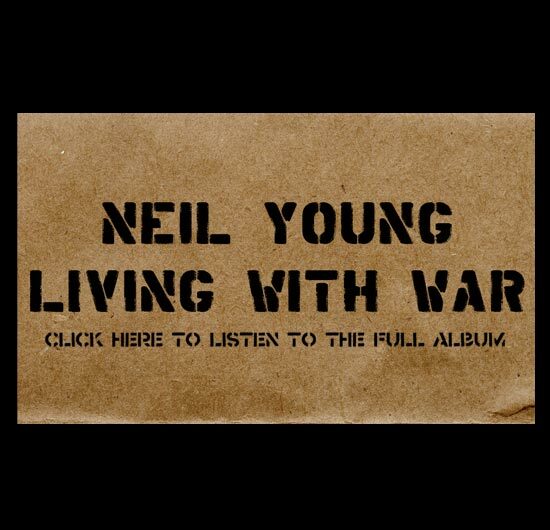 I'm pleased to be able to offer a link to the stream of Neil Young's protest album, Living With War, right here at Opinions You Should Have. Any album with a feel-good, uptempo party-beat anthem with the lyric "Let's Impeach the President!" has got to be pretty fine. Click on the album cover above (and then click again) and a media player will pop up and start playing the album, which Young expects to release on CD next week. 1) I believe I've answered that question ten times already. Let's move on. 2) I can't comment on a matter in which there is an ongoing criminal investigation. 3) I can assure you that nobody would like to know the answer to that question more than the President. 4) I don't know how you found out that I'm the new Press Secretary, but whoever leaked it to you has vitally damaged our national security and is an unwitting agent of al Qaeda. 5) That's a statement. Do you have a question? 6) Can you hold on to that? It's such a nice day today I'd like to move the briefing outside. 7) I've never really thought about it before, but that's a really interesting question. 8) You'd have to ask him that. 9) I don't know what he knew or didn't know or when he knew or didn't know it. 10) I am absolutely not thinking about stepping down. I assure you that there is no basis to the rumor that I may be leaving. I have personal assurances from the President that I will not be asked to leave. Having said that, I'm going to decline to answer your question in deference to my immediate successor. WASHINGTON (AP) -- The U.S. Capitol was evacuated shortly after noon Monday after the building briefly lost power. . . . Mary-Beth Hutchinson, a spokeswoman for Potomac Electric Power Co., said the electricity shut off automatically after there was ''a momentary drop in voltage due to customer operations up the lines'' away from the Capitol. A loss of electrical power in the Capitol Building panicked Republican congressmen when Capitol police unthinkingly told them that they had "completely lost all power" without explaining that the loss was electrical. Majority Leader John Boehner, who assumed that authorities had cut the electricity in order to effect a mass arrest of corrupt politicians, tried to throw himself from the visitors gallery. Because of the darkness, however, he ended up throwing himself into the lap of a lobbyist for a powerful oil consortium, he later claimed. As he saw "the blackness closing in," Tom Delay resigned and attempted to surrender himself to the Capitol Police, telling them that he had lost "the great game" and that "the money" had been invested in rare coins. Democrats took the power loss calmly, saying that it was just "business as usual." Minority Leader Nancy Pelosi knitted a sweater for a constituent throughout the ordeal.